Fitted sheet There are 8 products. Fitted sheet 100% combed cotton percale long fibers, weaving 80 threads/cm². Easy care treatment for easy ironing. For mattresses up to 25 to 30 cm high. Washable at 60°C and dryer allowed. Fitted sheet 100% pure cotton combed percale plain white, 200 TC. 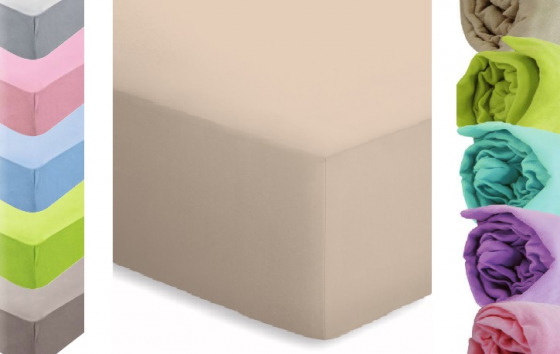 Nice, soft fitted sheet with an elegant finish, elasticated head and foot and in the width direction of the bed allowing a good hold on the mattresses up to 25 cm thick. Fitted sheet washable at 90°C, dryer allowed, treatment "easy care" which facilitates ironing. Fitted sheet 100% pure cotton combed percale, medium uni color, 200 TC. Nice, soft fitted sheet with an elegant finish, elasticated head and foot and in the width direction of the bed allowing a good hold on the mattresses up to 25 cm thick. Fitted sheet washable at 60°C, dryer allowed, treatment "easy care" which facilitates ironing. Fitted sheet 100% pure cotton combed percale, dark uni color, 200 TC. Nice, soft fitted sheet with an elegant finish, elasticated head and foot and in the width direction of the bed allowing a good hold on the mattresses up to 25 cm thick. Fitted sheet washable at 60°C, dryer allowed, treatment "easy care" which facilitates ironing.